We spoke in a previous post about the value of council records generally. In this post we shall examine one of the most significant and pervasive types of council records: the bylaw (sometimes spelled “by-law” or “byelaw”). In general, “bylaws” are rules or laws passed by an organization to regulate itself. Government bylaws refer to laws passed by a municipal council in order to approve its operating and capital budgets and to also regulate land use (zoning), animal control, traffic & parking, infrastructure projects, emergency planning, and other issues of municipal concern. Bylaws are also passed in order to confirm the proceedings of council, to appoint civic officials, and to amend or repeal (cancel) earlier bylaws. All bylaws passed by Canadian municipalities are done so under the authority of the province or territory in which the municipality resides. Under the system of governmental administration in Canada, all municipal corporations are “creatures of the province,” meaning that provincial or territorial governments have the authority to outline the borders, powers, and responsibilities of all municipal corporations within the province or territory. All municipal bylaws should therefore make reference to the provincial or territorial law or statute that enables the municipality to enact the bylaw. The current municipalities in the Peel area include the Region of Peel, the cities of Mississauga and Brampton, and the Town of Caledon, and they all derive their respective powers from the Province of Ontario. Names of civic officers appointed in any given year or term – i.e. the sheriff, clerk, engineer, etc. The locations of permitted “land uses” within the municipality – i.e. residential lands, industrial lands, parklands, etc. Bylaws are an invaluable resource for those interested in the social, economic, and political history of communities in the Peel area. They are also incredibly useful when seeking to understand the many ways in which elected officials exercised their powers as public administrators. The preservation of public morals was an active concern of municipal councils in this area during the 19th century. The Village of Brampton and the Township of Toronto (now the City of Mississauga) both passed very similar bylaws for this purpose in 1873 and 1874 respectively. The bylaws use remarkably similar language, suggesting that the two councils either corresponded about the bylaw, or perhaps copied the text from a template provided by the Province. Fines for infractions ranged from two to twenty dollars, and if the culprit could not pay he or she might end up in the County Jail. In many ways these bylaws serve to illustrate continuity and change across time: many of the concerns of the elected representatives in 1873/1874 are the same as those in power today; however, there are also some notable differences, including the prohibition against gambling (lotteries and casinos are now rather popular) and the prohibition against uttering “blasphemous” speech in public (the right to free speech, with some limited restrictions, is now a fundamental principle of democratic societies). At times the legal content of the bylaw is not what makes it of interest to archivists and researchers: often bylaws will come with attachments, such as maps, plans, and/or agreements, and sometimes these attachments are incredibly useful. For example, while working on an index to the Toronto Township bylaws, one of our volunteers recently came across a tax assessment bylaw with a fantastic 1951 roadmap of the township attached. At the moment this is the only known example of this particular roadmap within our archival holdings. It is an amazing resource for those interested in the history and development of the Mississauga area in the years following the Second World War. In particular, this map offers insights into the layout and composition of the then township just before extended development pushes in the late 1960s and early 1970s occurred, resulting in the rapid growth of industrial complexes and residential subdivisions. 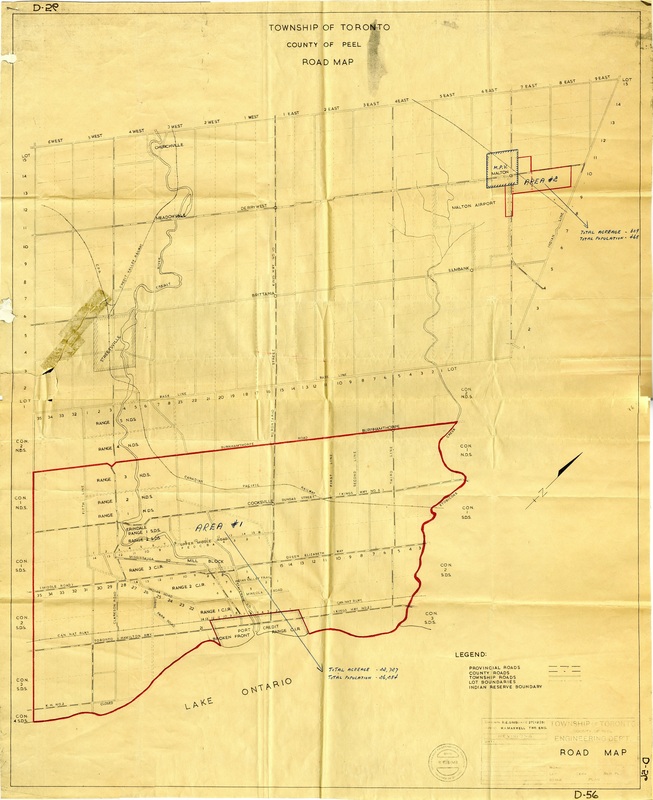 Among other things the map depicts provincial, county, and township roads along with the underpinning lots and concessions, as well as the location of the various crossroad settlements and rail lines. What should a researcher know about these records? The ranges and dates of the bylaws are different for each municipality. Researchers are encouraged to contact the Archives if they have a question about the availability of bylaws for any of the above municipalities. Diagram outlining the composition of the Region of Peel, including predecessor municipalities that would have created their own bylaws. Complete or partial indexes to the bylaws in our care exist for the County of Peel, the Township of Toronto, the Village & Town of Brampton, the Town of Caledon, and the Village & Town of Port Credit. 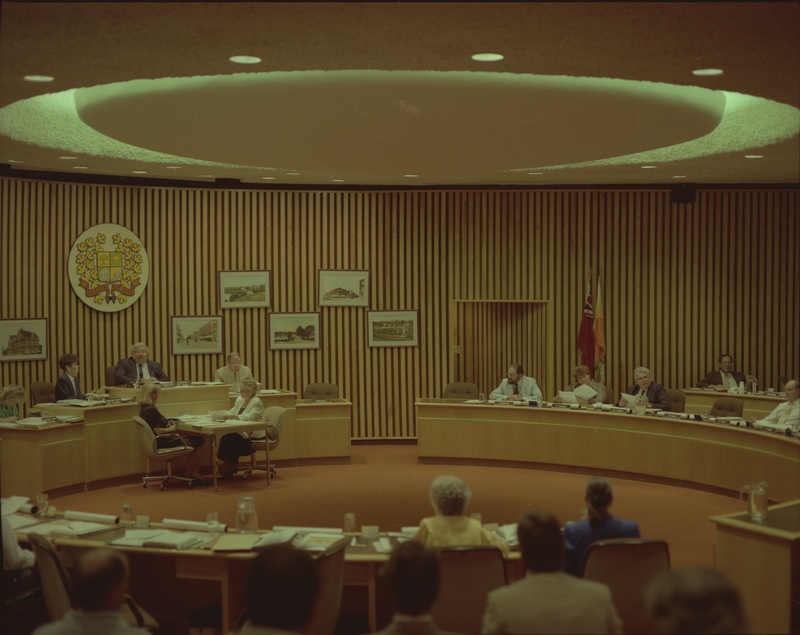 However, projects are currently planned or underway to complete indexes for all of the municipal bylaws in our holdings prior to 1974, so that these amazing resources can be more accessible to researchers and the general public. Hopefully you have enjoyed this brief discussion of the often overlooked but incredibly interesting administrative tool, the bylaw! Bylaws are the perfect example of how records have value far beyond their operational use. Once rescinded or amended, the bylaw ceases to have a regulatory value – but still retains fascinating informational value. Indeed! We are really excited about our ongoing indexing of these records, as those lists are revealing a wealth of information!